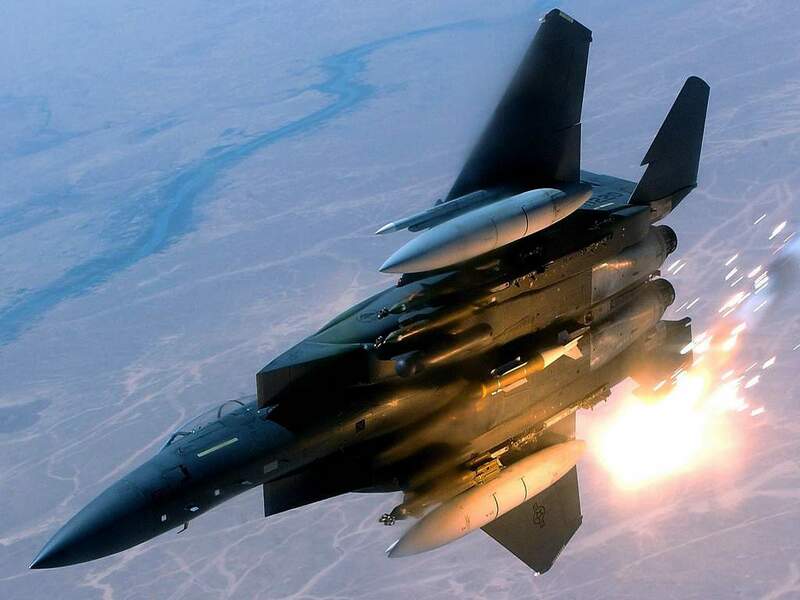 The F-15 Eagle is an all-weather, extremely maneuverable, tactical fighter designed to permit the US Air Force to gain and maintain air superiority in aerial combat. The Eagle's air superiority is achieved through maneuverability and acceleration, range, weapons and avionics. The F-15 has electronic systems and weaponry to detect, acquire, track and attack enemy aircraft while operating in friendly or enemy-controlled airspace. The weapons and flight control systems are designed so one person can safely and effectively perform air-to-air combat. The F-15's maneuverability and acceleration are achieved through high engine thrust-to-weight ratio and low wing loading. Low wing-loading (the ratio of aircraft weight to its wing area) is a vital factor in maneuverability and, combined with the high thrust-to-weight ratio, enables the aircraft to turn tightly without losing airspeed. 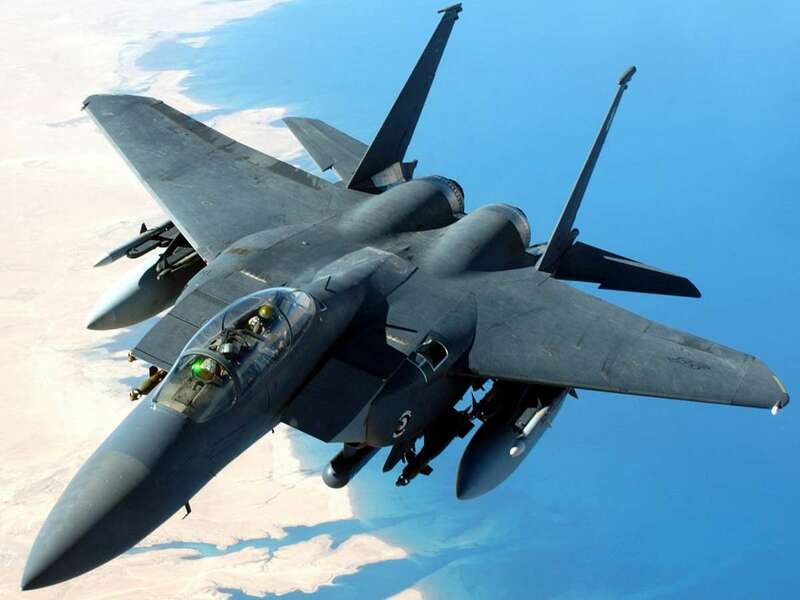 A F15 multimission avionics system includes a head-up display, advanced radar, inertial navigation system, flight instruments, ultrahigh frequency communications, tactical navigation system and instrument landing system. It also has an internally mounted, tactical electronic-warfare system, "identification friend or foe" system, electronic countermeasures set and a central digital computer. The head-up display projects through a combiner, all essential flight information gathered by the integrated avionics system. This display, visible in any light condition, provides the pilot information necessary to track and destroy an enemy aircraft without having to look down at cockpit instruments. The Eagle can be armed with combinations of four different air-to-air weapons: AIM-7F/M Sparrow missiles or AIM-120 AMRAAM advanced medium range air-to-air missiles on its lower fuselage corners, AIM-9L/M Sidewinder or AIM-120 missiles on two pylons under the wings, and an internal 20mm Gatling gun in the right wing root. Low-drag, conformal fuel tanks were especially developed for the F15-C and F15-D models. Conformal fuel tanks can be attached to the sides of the engine air intake trunks under each wing and are designed to the same load factors and airspeed limits as the basic aircraft. Each conformal fuel tank contains about 114 cubic feet of usable space. These tanks reduce the need for in-flight refueling on global missions and increase time in the combat area. 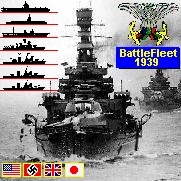 All external stations for munitions remain available with the tanks in use. AIM-7F/M Sparrow missiles, moreover, can be attached to the corners of the conformal fuel tanks. The single-seat F-15C and two-seat F15-D models entered the Air Force inventory beginning in 1979. These new models have Production Eagle Package (PEP 2000) improvements, including 2,000 pounds (900 kilograms) of additional internal fuel, provision for carrying exterior conformal fuel tanks and increased maximum takeoff weight of up to 68,000 pounds (30,600 kilograms). 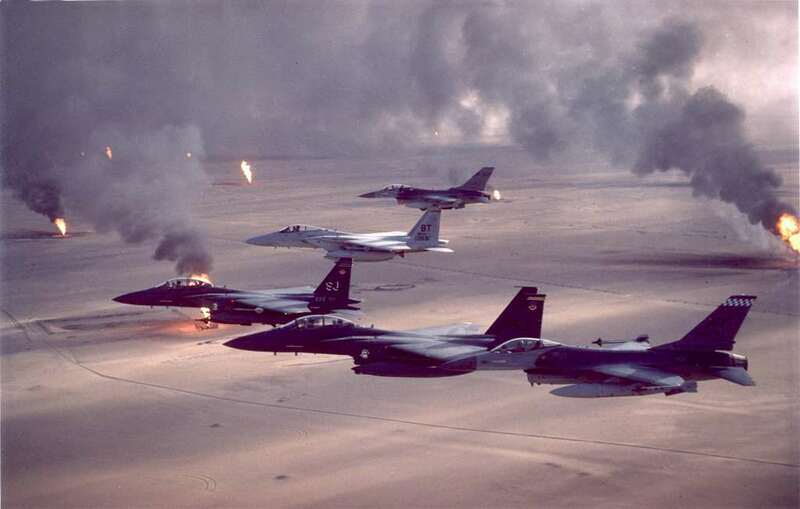 F-15C, D and E models were deployed to the Persian Gulf in 1991 in support of Operation Desert Storm where they proved their superior combat capability with a confirmed 26:0 kill ratio. F-15 fighters accounted for 36 of the 39 Air Force air-to-air victories. F15-Es were operated mainly at night, hunting SCUD missile launchers and artillery sites using the LANTIRN system. They have since been deployed to support Operation Southern Watch, the patrolling of the No-Fly Zone in Southern Iraq; Operation Provide Comfort in Turkey; in support of NATO operations in Bosnia, and recent air expeditionary force deployments. Armament: One internally mounted M61 Vulcan 20mm six-barrel cannon with 940 rounds of ammunition; four AIM-9L/M Sidewinder and four AIM-7F/M Sparrow air-to-air missiles, or eight AIM-120 AMRAAMs, carried externally. F-15E can carry any combination of the above missiles, as well as GBU16/27/28 Laser Guibed Bombs (LGBs), GBU-15 EO-guided (Electro-Optically guided, i.e. 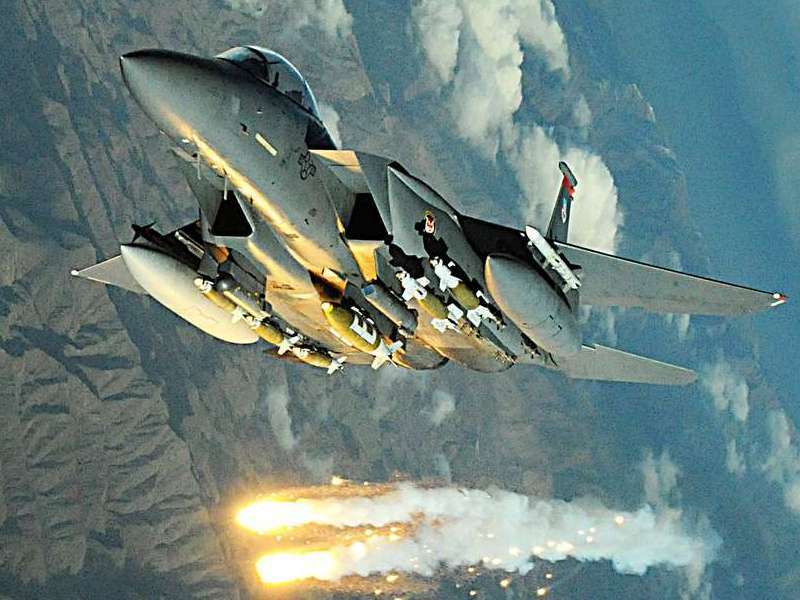 TV guided) glide bombs, and rocket powered versions of these (AGM-130), laser guided AGM-65 Maverick Air-to Ground Missiles, Rockeye and CBU-49 Cluster Bombs, Fuel Air Explosives, 'Dumb bombs' )or 'Iron bombs', i.e. unguided bombs), and (although this is unlikely to be required) B61 nuclear bombs. Inventory (USAF): Active force, 396; Reserve, 0; ANG, 126. Single-seat all-weather air-superiority fighter version, 384 built 1972-79. Two-seat training version, formerly designated TF-15A, 61 built 1972-79. Improved single-seat all-weather air-superiority fighter version, 483 built 1979-85. Two-seat training version, 92 built 1979-85. Single-seat all-weather air-superiority fighter version for the Japan Air Self-Defense Force 139 built under license in Japan by Mitsubishi 1981-97, 2 built in St. Louis. Two-seat training version for the Japan Air Self-Defence Force. 25 Built under license in Japan by Mitsubishi 1981-97, 12 built in St. Louis. The F15 N was a carrier-capable variant proposed in the early 1970s to the U.S. Navy as an alternative to the heavier and, at the time, considered as "riskier" technology program: F-14 Tomcat. The F-15N-PHX was another proposed naval version capable of carrying the AIM-54 Phoenix missile. These featured folding wingtips, reinforced landing gear and a stronger tail hook for shipboard operation. One stripped and unpainted F-15A, demonstrated the fighter's acceleration  broke eight time-to-climb world records between 16 January and 1 February 1975. It was delivered to the National Museum of the United States Air Force in December 1980. The first F15 B was converted into a short takeoff and landing, maneuver technology demonstrator aircraft.In the late 1980s it received canard flight surfaces in addition to its usual horizontal tail, along with square thrust-vectoring nozzles. It was used as a short-takeoff/maneuver-technology (SMTD) demonstrator. The F-15 ACTIVE was then converted into an intelligent flight control systems research aircraft. F-15B 71-0290 is the oldest F-15 still flying as of January 2009. Two F-15A aircraft were acquired in 1976 for use by NASA's Dryden Flight Research Center for numerous experiments such as: Highly Integrated Digital Electronic Control (HiDEC), Adaptive Engine Control System (ADECS), Self-Repairing and Self-Diagnostic Flight Control System (SRFCS) and Propulsion Controlled Aircraft System (PCA). F15 was returned to the Air Force and became a static display at Langley AFB in 1983. * Israeli Air Force has operated F-15 since 1977, received under Peace Fox I, II and III. These aircraft are currently organized into two F15-A/B squadrons and one F15 C/D squadron. The first 25 F-15A/Bs were early USAF production airframes, equipping 133 Squadron. The second batch was temporarily embargoed as a result of the 1982 Lebanon War. The IAF had 42 F-15 A/C and 25 F-15 I aircraft in service as of November 2008. * Japan Air Self-Defence Force acquired 203 F-15 J and 20 F-15 DJ from 1981, of which 2 F-15 Js and 12 F15-D were made in U.S. and the rest by Mitsubishi under license. These aircraft are currently operated by 2 Hikotai (squadron) of 2. Kokudan (Air Wing), Chitose Air Base, 1 Hikotai of 5. Kokudan, Nyutabaru AB, 1 Hikotai of 6. Kokudan, Komatsu AB, 2 Hikotais of 7. Kokudan, Hyakuri AB and 1 Hikotai of 8. Kokudan, Tsuiki AB. 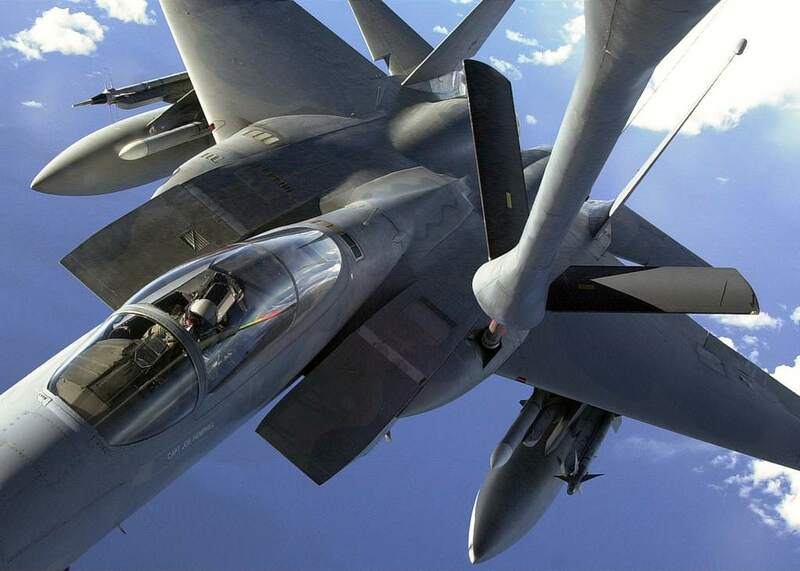 In June 2007, the Air Self-Defense Force decided to upgrade certain F-15 aircraft with synthetic aperture radar pods; these aircraft will replace RF-4 aircraft currently in service. Japan had 157 F-15Js in use as of November 2008. * Royal Saudi Air Force has operated 4 squadrons of F-15 C/D (55/19) since 1981, received under Peace Sun. They are based at Dhahran, Khamis Mushayt and Taif air bases. 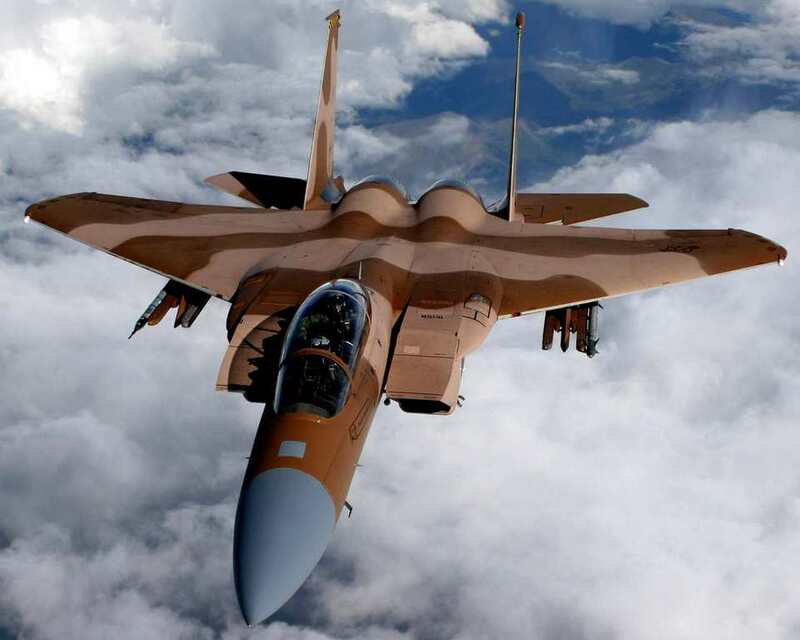 A stipulation in the Camp David Peace Agreement limited the number of Saudi F15 to 60, holding surplus air frames in Luke AFB for RSAF pilot training. This limitation was later abandoned. The RSAF had 139 F15 C/S Eagles in operation as of November 2008. * United States Air Force operated 630 F15 aircraft (499 in active duty and 131 in ANG, all variants) as of September 2008. The F-15 is being replaced by the newer F-22 Raptor. The F-15 landed at twice the normal speed to maintain the necessary lift, and its tailhook was torn off completely during the landing. Zivi managed to bring his F-15 to a complete stop approximately 20 ft (6 m) from the end of the runway. He was later quoted as saying "(I) probably would have ejected if I knew what had happened." The fuel leak and vapors along the wing had prevented him from seeing what had happened to the wing itself. On 19 March 1990, an F-15 from the 3rd Wing stationed at Elmendorf AFB, AK accidentally fired an AIM-9M Sidewinder missile at another F-15. The damaged aircraft was able to make an emergency landing; it was subsequently repaired and returned to service. On 22 November 1995, during air-intercept training over the Sea of Japan, a Japanese F-15J flown by Lt. Tatsumi Higuchi was shot down by a AIM-9L Sidewinder missile accidentally fired by his wingman in an incident similar to the one that occurred on 19 March 1990. The pilot ejected safely. Both F-15Js involved were from JASDF 303rd Squadron, Komatsu AFB. On 26 March 2006 during a low flying training exercise over the Scottish Highlands, two US Air Force F-15Cs crashed near the summit of Ben Macdui in the Cairngorms. Both, Lieutenant Colonel Kenneth John Hyvonen and Captain Kirk Jones died in the accident which would later result in a court martial for an RAF air traffic controller, who was later found not guilty. On 2 November 2007, a 27-year-old F-15C (s/n 80-0034 of the 131st Fighter Wing) crashed during air combat maneuvering training near St. Louis, Missouri. The pilot, Maj. Stephen W. Stilwell, ejected but suffered serious injuries. The crash was the result of an in-flight breakup due to structural failure. On 3 November 2007, all non-mission critical models of the F-15 were grounded pending the outcome of the crash investigation, and on the following day, grounded non-mission critical F-15s engaged in combat missions in the Middle East. By 13 November 2007 over 1,100 were grounded worldwide after Israel, Japan and Saudi Arabia grounded their aircraft as well. F15-Es were cleared on 15 November 2007 pending aircraft passing inspections. On 8 January 2008, the USAF cleared 60 percent of the F-15A-D fleet for return to flight. On 10 January 2008, the accident review board released its report stating the 2 November crash was related to the longeron not meeting drawing specifications. The Air Force cleared all its grounded F-15A-D fighters for flight on 15 February 2008 pending inspections, reviews and any needed repairs. In March 2008, Stilwell, the injured pilot, filed a lawsuit against Boeing, the F-15's manufacturer.